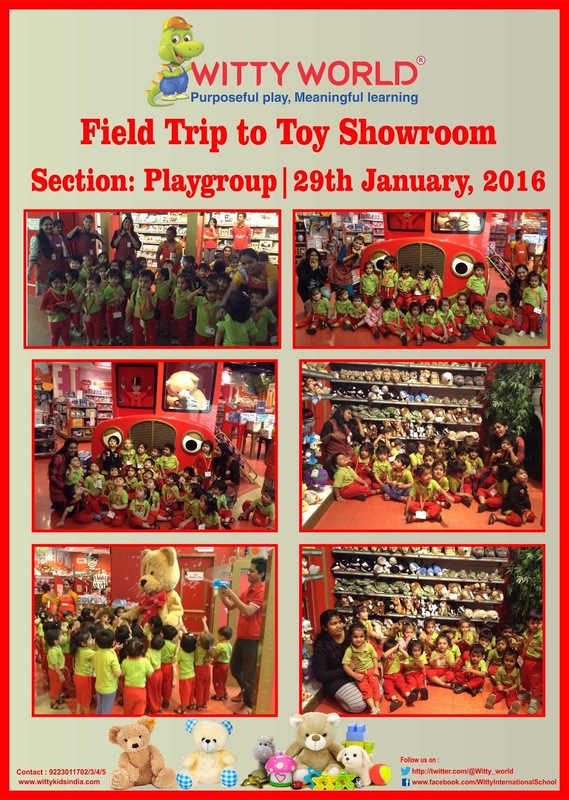 Friday, 29th January 2016…..As a celebration of the “wonder years of childhood”, and as an extension of their theme for the month, TRADITIONAL TALES, Play Group children at Witty World Bangur Nagar were taken for a field-trip to HAMLEYS toy store . Needless to say, children came with zest were excited, and had great fun. The staff at Hamleys were in high spirits and went out of their way to demonstrate various toys to the children. They allowed them to explore every nook and corner of this wonderland !! The children and teachers, will definitely relish the memory of this trip for a long time to come. Lots to play with for girls and boys. And pretend I’m going to school. Field trip to ‘Hamleys Toy Store’ was conducted for playgroup children of Witty Kids on Friday, 29th January 2016. 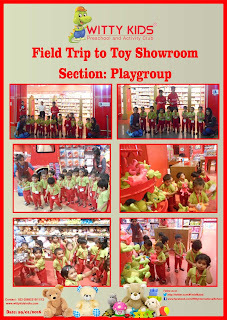 Children were given a warm welcome by the store staff. It was a fantasy world which came alive for our little Wittians. Children were fascinated looking at all their favourite story character toys. The store staff had arranged for activities like Musical mat and bubble making. It was a fun filled trip for children and teachers, and we all had a gala time at the store. A big Thank-You to the store team for making it a memorable trip. and who do you think they be? turn them out, Knaves all three. Enacting rhymes has a positive influence on children. It helps in the development of imagination, and, as we all know, dramatization is a great tool for learning. 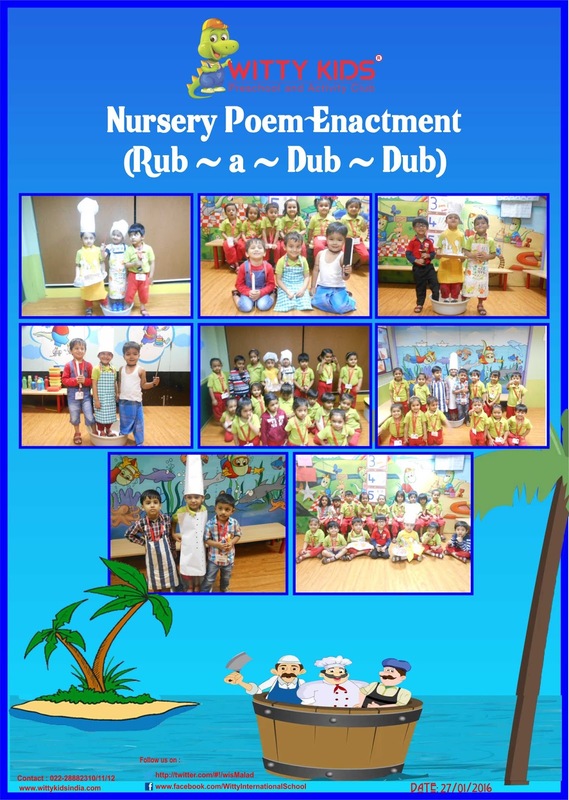 At Witty World, our little ones in the nursery class enjoyed enacting the popular rhyme, RUB-A-DUB 3 men in the tub. 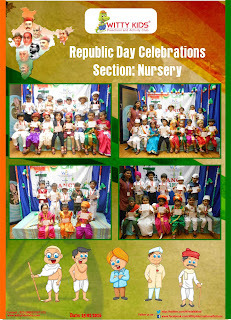 The children of Nursery section were dressed as a butcher, a baker and a candlestick maker, who brought the poem alive for the entire class as they animatedly recited the poem. Children enjoyed the experience of singing the rhyme with the three men. I wish I could swim like you. The little sparkling stars of Nursery,Witty Kids, Shastri Nagar, Bhilwara celebrated Fancy Dress on Thursday , January 28 ' 2016. Children were thrilled to see the portico decorated as ocean scene with blue water and various marine creatures . Kids came dressed as their favourite marine creature like Star fish, Golden Fish, Jelly Fish, Sea Horse, Frog, Turtle , Crocodile and they acted like them .The children could identify the marine creatures done for the past few days and enjoyed the activity.It was a fun learning experience for the kids. 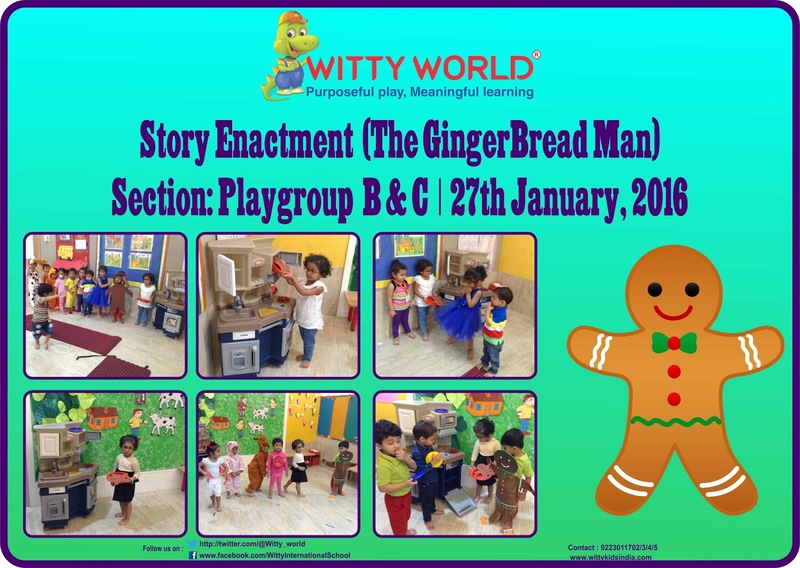 The sparkling stars of Nursery WIS celebrated Fancy Dress with great zeal and excitement. The kids came dressed up as different marine creatures like turtle, jelly fish, starfish, octopus, crocodile, etc. Portico was decorated as an ocean with blue colour balloons and clothes. The kids excitedly came on mike and spoke according to the creature they were dressed. Through this activity, kids did the recap of marine creatureS. This was a fun learning experience for them. Stories fascinate children the most. 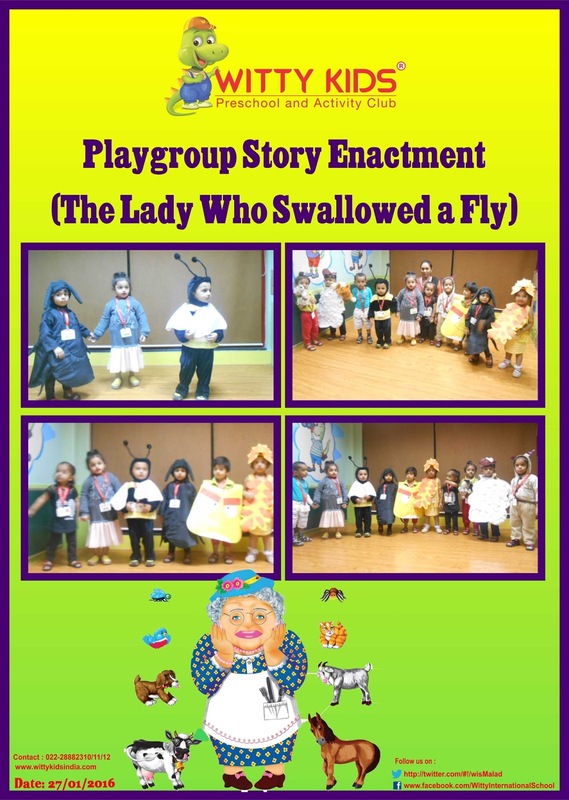 Narration and enactment of stories have a positive influence on children. 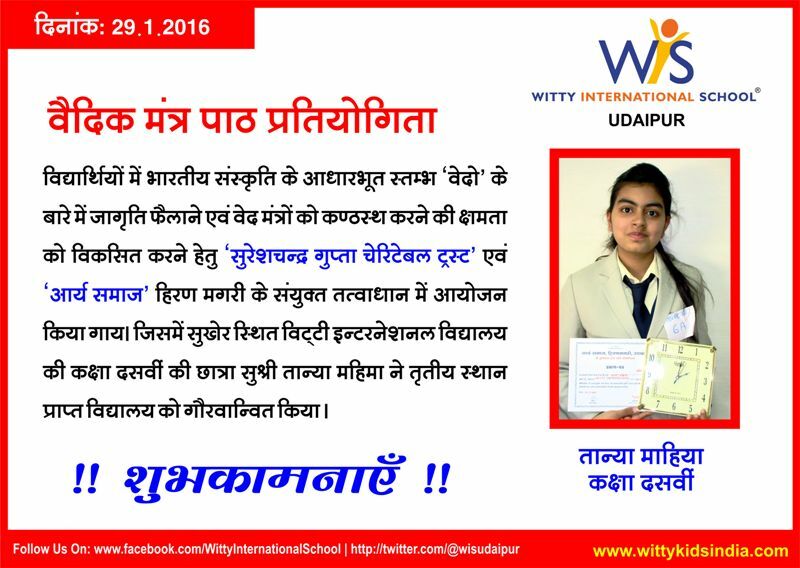 It helps in the development of imagination and is a great learning tool, as it allows children to get into the skin of a character. 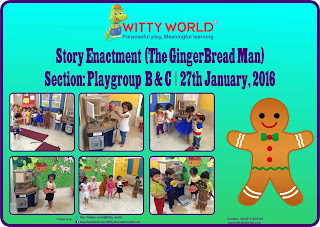 Children of Playgroup came dressed as the characters of their favourite story The Ginger Bread Man & The Lady Who Swallowed a fly. They enjoyed narrating the story and depicting the same, while the rest of the class thoroughly enjoyed watching the story come alive in front of their eyes!! 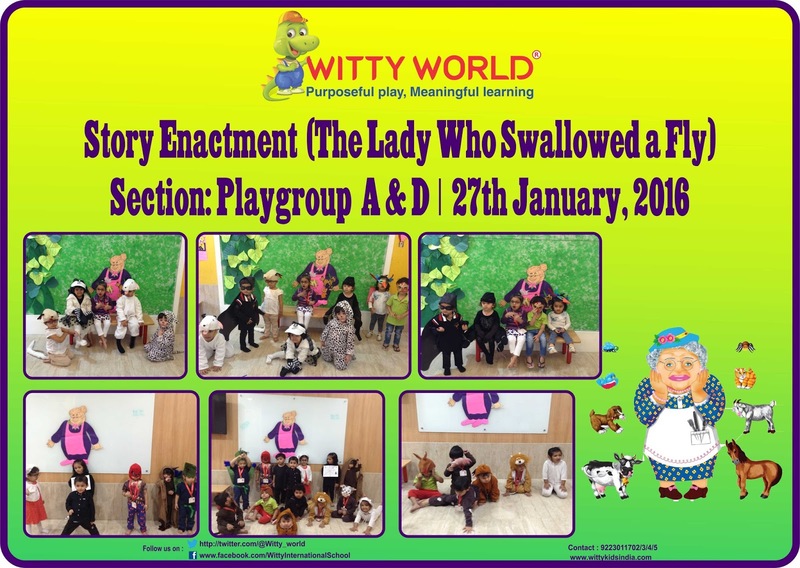 Little Wittians of Playgroup section at Witty Kids had ‘Story Enactment Day’ on Wednesday, 27 January 2016. Children enacted on the stories of ‘Little Red Riding Hood’ and ‘The Lady Who Swallowed a Fly’. 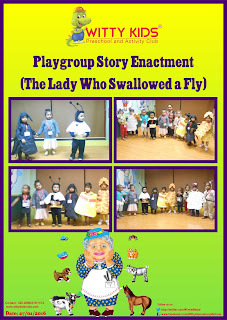 They came dressed as different characters in the stories, and enthusiastically participated in the story enactment. 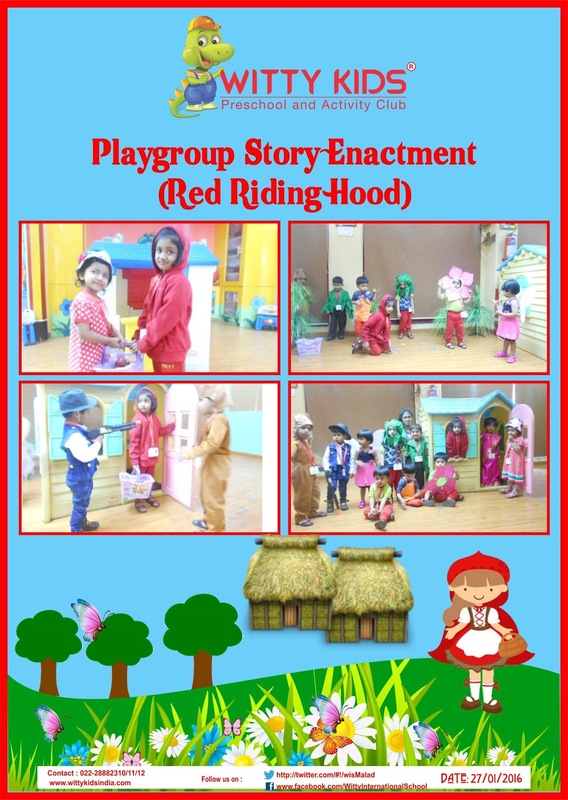 Children got into their characters and explored various expressions and emotions through these familiar fairy tales. Enactments are always a lot of fun; it also provides an opportunity for dramatizing, emoting and empathizing. 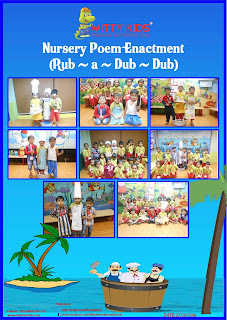 Children in the nursery class at Witty Kids had great fun enacting on the rhyme RUB –A –DUB – DUB on Wednesday, 27 January 2016. Children came dressed as designated characters such as a butcher, a baker and a candle stick maker in the rhyme. The class came alive as our little Wittians animatedly recited the poem. It is important to be aware of one’s National History. 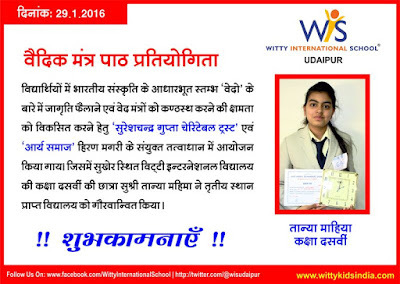 At Witty Kids we make sure that even in today’s modern world we still give importance to our country’s history. 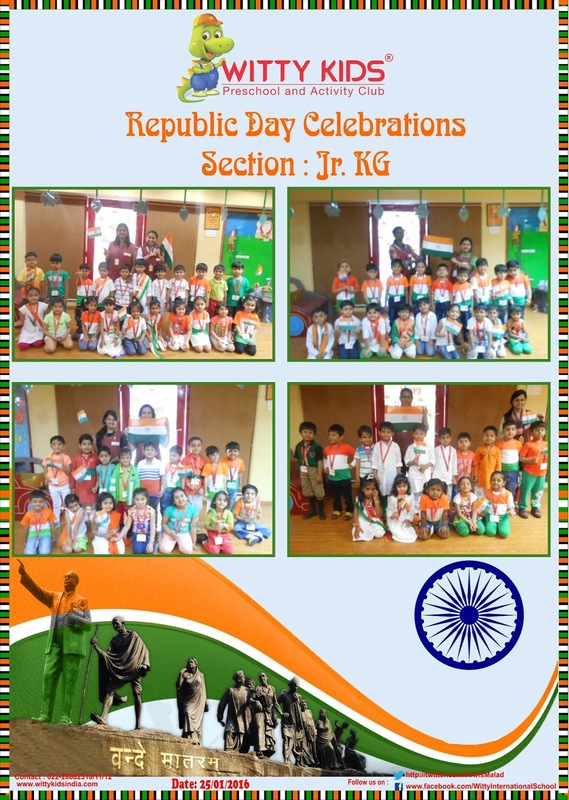 So the children of Pre-Primary section celebrated India’s ‘66th Republic Day’ on Monday, 25th January 2016. Children of Playgroup & Jr.KG classes came dressed in tri-coloured clothes whereas children of Nursery class had a fancy dress event where in the children came dressed as freedom fighters. 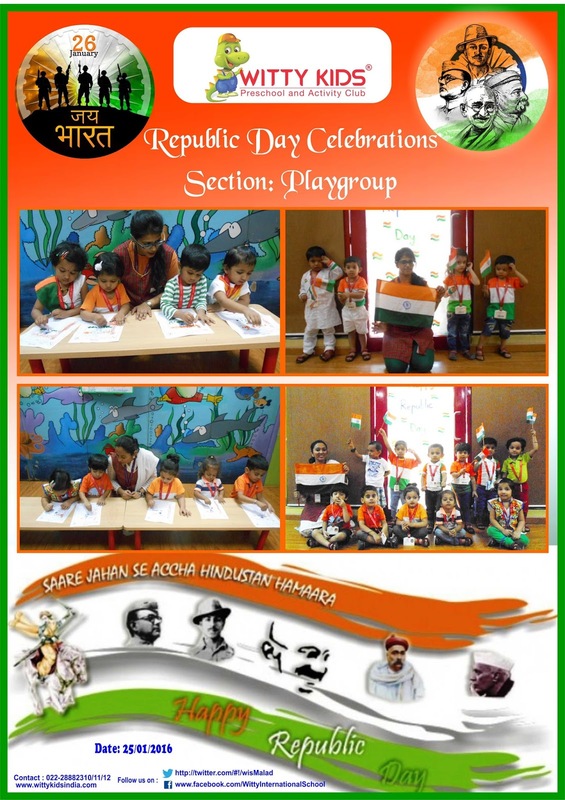 Teachers explained the importance of Republic Day and why it is celebrated. 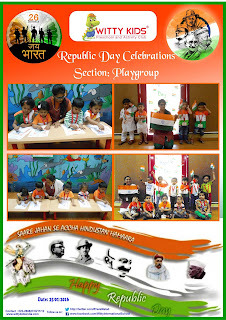 Pg, Nursery and Jr.KG section children did art activity. Children sang patriotic songs Later they had great fun dancing to the tunes of the patriotic songs. Witty International School organised a grand closing ceremony of 'Synergy' The Annual Sports Meet 2015-2016 on 26 January, 2016. Its objective was to develop sportsman spirit, comradeship and to provide a venue to display their physical prowess. The progamme commenced with the Flag Hoisting Ceremony on the occasion of Republic Day. The Chief Guests for the day were Mr. Nikhil Doru, Ranji Cricket Player and Ms. Leena Sharma. This was followed by a welcome speech by the Principal Ms. Shubha Govil and felicitation of our eminent guests. The programme began with the energetic March Past followed by the inspection of the four houses by the Chief Guests. The children and parents of Grade -I enjoyed Parent-Child Races followed by the Relay Races of students from Grade III-VIII. 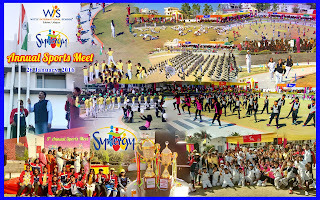 In continuation of the programme, energetic Calisthenics exercises by Grade VII and VIII were presented. In the age when the child learns to walk Wittians of Jr.KG and Sr.KG mesemerized the audience with the heart winning Skating Drill. A spectacular “Circus Drill” was presented by the students of Grade- II, giving the message that the use of animals in circus should be banned and the talent and art of people should be promoted. The bevy of events for the day included dynamic Yoga Drill, zealous Zumba and Aerobics. The proud winners of the various house wise activities organized throughout the year were honored with the Rolling Trophy by the dignitaries. Topaz House was the proud House to win the Rolling Trophy and the Runner Up House was Ruby House. While addressing the gathering the Chief Guest said, “It is commendable to see the participant’s commitment and involvement”. He appealed to the parents to let the children grow through participation in extracurricular activities. Witty Parents can now submit their articles for them to appear on Witty Blog. Click here to send your article. Website by En Interactive Technologies Pvt. Ltd.